Thousands of people are seen enjoying the Car Free Day held along Jalan Mampang Prapatan, South Jakarta, Sunday (8/27).
" 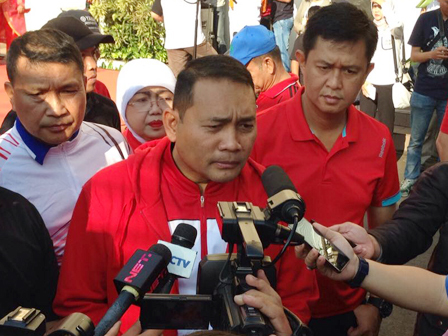 We focus on project of MRT and other infrastructures, thus we can't hold it routinely"
South Jakarta Vice Mayor, Arifin disclosed, the event is the first in its region this year. "We focus on project of MRT and other infrastructures, thus we can't hold it routinely. But now, it will be held routinely," he expressed. He explains it will be held in the third week of every month from 6-11 AM. "We will hold it once a month. This is a strategic program of Jakarta Provincial Government in order to reduce air pollution," he stated. His party will evaluate it today thus its implementation can be better again in the next month. "We will remain do evaluation to perfect the event," he closed.